Lets face it the stock Glock plastic sights are durable and will put you on target, however they leave a lot to be desired when the lights go out. Obviously I had invested in my Salient Arms International - SAI Glock 17 so just a bit more to make it perfect was not a big decision. My shopping adventure landed me on the AmeriGlo.net site where I quickly separated $79 from my wallet for a set of AmeriGlo CAP Night Sights. AmeriGlo manufactures two products lines; premium tactical chemical glow sticks and high precision weapon sights machined from US-made bar stock steels and assembled using Swiss-made tritium light sources. AmeriGlo’s Weapon Sight division specializes in delivering their own proprietary iron sights as a consumer brand as well as a branded line of sights for many big names in the firearms industry. 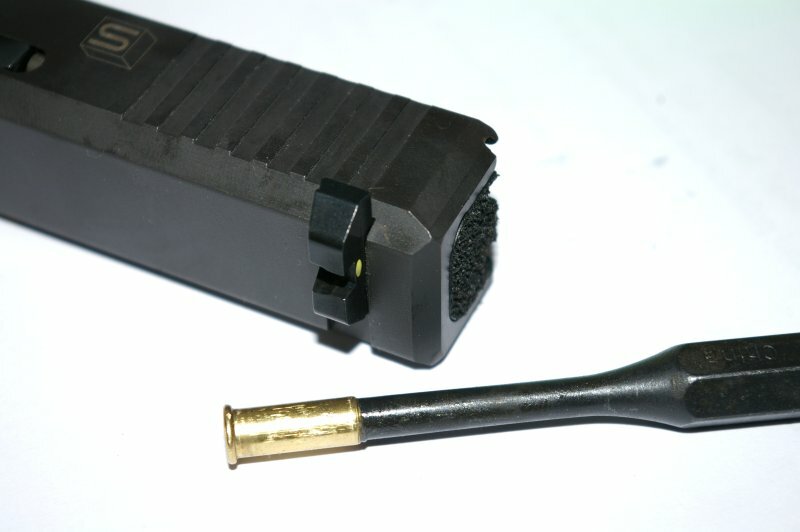 Chances are that if your factory firearm has high quality steel sights, then it most likely is an AmeriGlo sight. Installation was as simple as removing the old sights and re-installing the new AmeriGlo CAP sights. I recommend using a Sharpie or pencil to mark the center zero of the old rear sight before removal so that you can rezero the new sight on the bench. The mark will come right off with a little gun oil. I used a ¼” punch tipped with a .22LR case to prevent marring and tapped out the old rear sight and tapped in the new AmerigGlo rear sight aligning to the old zero point. The front Glock sights are retained by a small screw which requires a Glock front sight tool unless you are big on swearing while attempting to remove it with needle nose pliers. 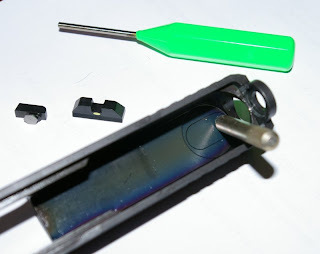 AmeriGlo has an Economy Front Sight tool for only $5 which I highly recommend over butchering the screw removal and installation using a pair of pliers. 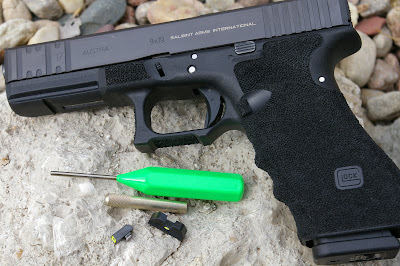 Use the tool and unscrew the front sight and screw on the new one... a Glock sight replacement is definitely not brain surgery. I would recommend adding a dab of LocTite to the front screw as it is a metal on metal fitting which could work loose. 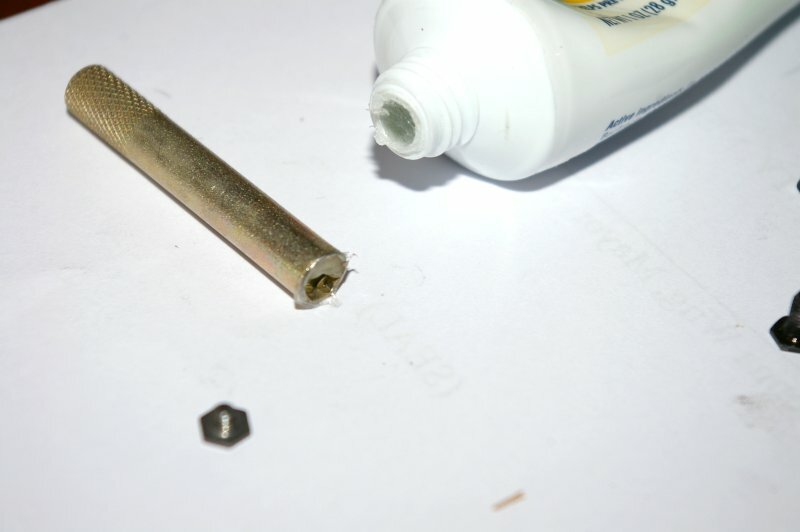 Tip - Use a little Vaseline to hold the sight screw in the tool. 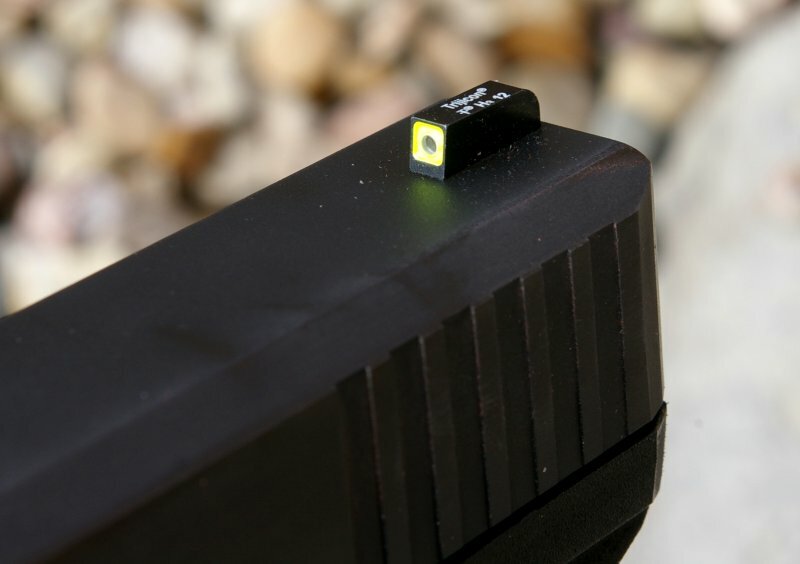 The CAP sight set features a bright Tritium front sight dot with a large lime green photoluminescent green outline which allowed me to quickly pick up the front sight regardless of lighting. The rear sight features a horizontal green bar to ensures that the shooter can easily stack the square on the bar even at night. 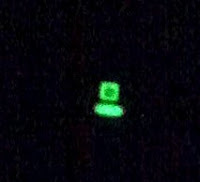 The Tritium dot is nice and bright, however if you have an opportunity to flash the sights with your Surefire tac light before investigating that bump in the night, you will be greeted with sights that look like they are powered by alien technology for about 20 minutes. AmeriGlo is clearly using the best photoluminescent coating available. I would say the coating is basically glow in the dark paint however that would be like saying a 22oz T-bone steak is decent snack food. There is no comparison of this photoluminescent coating quality and brightness to anything I have ever used. Functionally I liked this setup and found it fast on the target. From a durability perspective both the front and rear machined steel sights are finished with a hard black nitride finish. 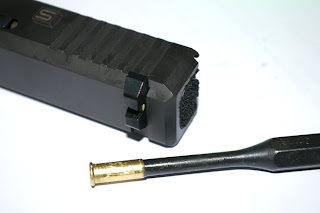 The finish delivers a corrosion resistant design which has proven itself tough and durable even though scrape and rake charging drills using my holster or belt to charge the Glock single handed. If I have never broken a set of stock plastic sights, so I believe these AmeriGlo Cap sights should be nothing short of totally indestructible. 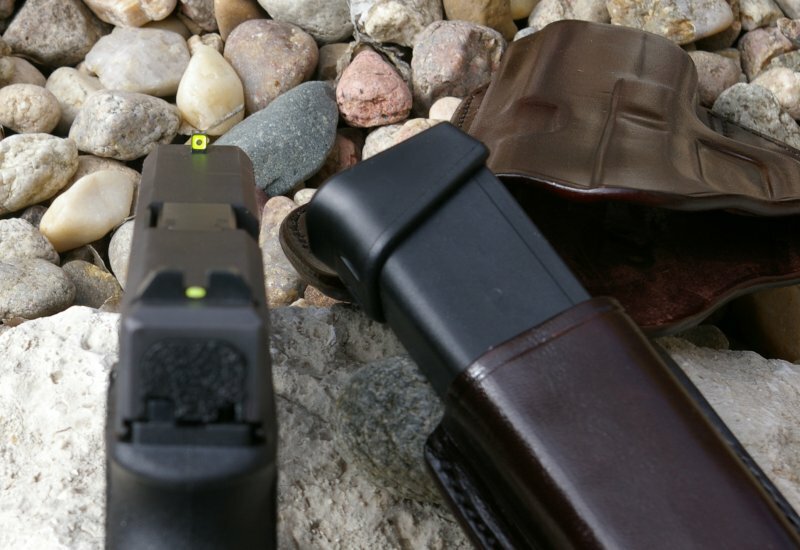 Will a new set of AmeriGlo Cap sights make you more accurate? No, however the night sight versions they offer for various firearms will deliver a significant confidence improvement when things get dark. The question I find asking myself is whether I would have the confidence to take a defensive lifesaving shot with a loved one as a hostage in a very low light situation. 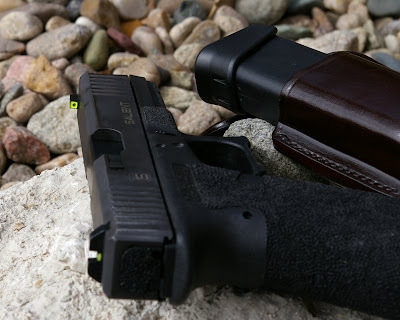 Non-illuminated sights make this tough situation even tougher so I though it prudent to add these to my SAI G17. The CAP design is fat on target, however i would not say it is a game changer for me until the lights go dim. The AmeriGlo Cap Sights may not make me significantly faster, however they do give me a significant higher confidence level in all lighting conditions. Can you include a range report with photos?